There is no other bishop from north-Germany where we know as much about out of written origins as about Bernward. He was born aristocratic in 960, he got a profound education at the highly respected cathedral-school, which qualified him for pedagogic, diplomatic and clerical duties. Bernward was not only the educator of the posterior King Otto III., else he was “aulicus scriba doctus” member of the minor circle of the royal notaries, which were important at the administration and development of the German Reich. 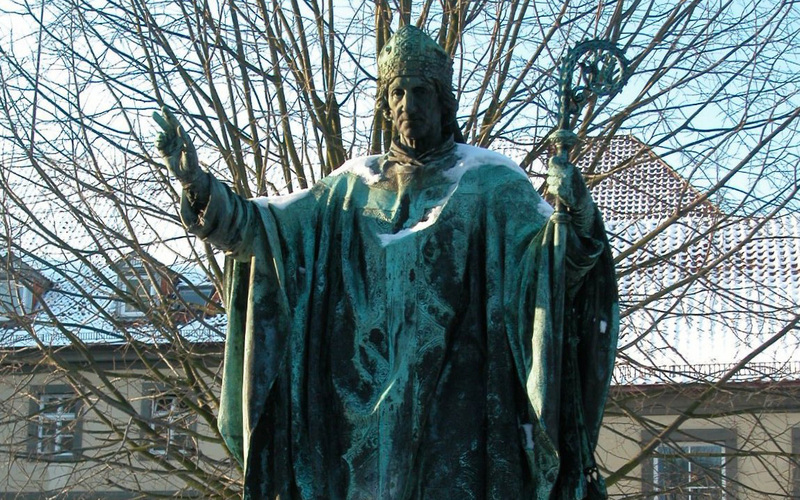 Bernward became bishop of Hildesheim in 993: a duty which he held until his death on 22 November 1022. Bishop Bernward, who had diverse duties on the regimen, was quite benedictive for Hildesheim. Quite sincere he worked on the transliteration of the Hildesheim “Bistumssprengels” (Ganderheimer quarrel), else he tried really hard to save the boardes of the diocese against outer influences. By means of diocesesynods Bernward took influence on the liturgic and pastoral routine of the congregationals in the diocese Hildesheim. The bisphop achieved a lasting presence by his constructional and artistical activities. Excellent was the building of the St. Michaeliskirche and the appendant cloister, which was built as a centre of intellectual and spiritual innovation in 1010, as well as it was his sepulchre. Evidence of the Bernward-art are the Bernward-doors and the christcolumn: masterpieces of high quality – and at the same time medias of medieval theology and medieval faith transmission. Bishop Bernward was buried in the crypt of St. Michaeliskirche, it soon became a destination for religious prilgrims. The official acceptance by church followed 200 years later in August 1194. His worship was focused in Hildesheim through the centuries. Commemoration day of hl. Bernward is on 20 November.